The Sacramento area got almost 4” of rain in the foothills on this February day in 2016! That happens more often, but this time it was so welcome because California has been in a drought for 5 years. 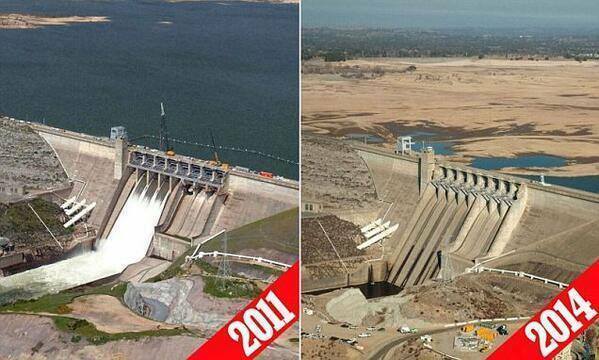 The news media have been telling us that we need to conserve water. Governor Brown even demanded a 25% reduction every month based on the 2013 water use, so the media duty fully reported the actual reductions each month. For the month of February (2016) it was 24.6 %, just below the required 25%. “But who cared, we were getting some rain and snow now so we can cheat a little, right?” Ben thought. As Ben was watching the news with his friend Paul, it showed the huge Folsom Dam with water spilling over two of the spillways and the newscaster saying two more spillways would be opened later that day. The newscaster was prepared for that question and resumed:“ We have people calling in asking why they are releasing so much water in this drought season; we’re only at 83% of average precipitation!” He went on: “Folsom Lake is filling up fast and if we don’t release water now there will be no room left for the snow melt come this spring.” It takes 10x more time to release the same amount of water, than it takes to fill Folsom Lake with a couple of 3-4” rainfalls. “How could Lake Folsom fill up so fast with an average of 83% precipitation to-date, when only a few months ago the lake was literally just about empty?” Ben thought. “If the lake fills up this fast, and we got very little snow and rain in February, we are way short of storage capacity!” Ben couldn’t believe he said that, because a week ago he was still thinking: Just because the lakes are filling up does not mean we are out of the woods yet, concerning the drought. “Then nobody worried about not having enough water after the winter,” Ben replied. Ben changed his mind and believes we actually are behind in building dams. Before, he thought that more dams wouldn’t make any difference; that all it would do is increase our consumption and there never would be enough water in California anyway. Now he realizes that those reservoirs fill up so fast that a few more will be very helpful. Ben’s son recently told him that the release program of water is based on outdated information. That information was valid years ago when there was plenty of rainfall and more water had to be released to make room for snow run-off. Now that we use more water, the program has to be updated, but that will become a story for another time. It’s all just a drop in the Bucket.